COPENHAGEN, Denmark, Jan. 10, 2019 — (PRNewswire) — The start of the year kicked off with a flurry for SYBO Games, the company behind the mobile game phenom Subway Surfers, named the second most downloaded game of 2018, as David Byrne joins the company as chief operating officer; Naz Amarchi-Cuevas is promoted to chief commercial officer; more than 10 licensing agents around the globe sign on to represent SUBSURF®, the brand's consumer and lifestyle merchandising arm; and the reveal of a surprise 11th episode in the Subway Surfers: The Animated Series on YouTube, Friday, Jan. 11. 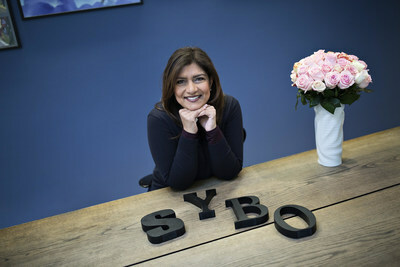 As SYBO Games chief operating officer, newly added Byrne is charged with heading up strategy and operations for the studio, strengthening the Subway Surfers gaming roadmap, as well as setting up the right teams for additional games, genres and intellectual properties. Byrne's extensive gaming background over almost 25 years in the industry includes COO posts at NaturalMotion, Rovio, Playfish and Electronic Arts UK. In her new role as chief commercial officer, Amarchi-Cuevas' responsibilities will now include franchise strategy and IP development, brand marketing, consumer products licensing and overall commercial strategy. "David's wealth of experience and vast connections in the games industry combined with his incredible leadership qualities will be vital as we power into the year," said Mathias Gredal Norvig, SYBO Games' chief executive officer. "With David on board, we are in a prime position to move full speed ahead and seize ambitious opportunities. "In the last 18 months, Naz has been instrumental in creating a commercial foundation for the brand, implementing a spot-on business strategy that expands the Subway Surfers universe, while developing and empowering the teams," Norvig continued. "David and Naz complete our executive team and we now have a strategic, commercial and operational powerhouse ready to win big in 2019 and beyond." SYBO is equally proud to announce that multiple licensing agents have signed on to further extend the SUBSURF global licensing and merchandise program. These include: Retail Monster for United States, based in Los Angeles, Bentonville, Orlando and New York; Retail Monster UK for the United Kingdom (England, Scotland, Wales and Northern Ireland), based in London; BN Licensing for Belgium, Netherlands and Luxembourg, based in Brada/Amsterdam; Premium Licensing for Italy, based in Milan; Mega Licensing for Russia, Armenia, Azerbaijan, Belarus, Georgia, Kazakhstan, Kyrgyzstan, Moldova, Tajikistan, Turkmenistan, Ukraine, Uzbekistan, based in Moscow; Dream Theatre for India, Pakistan, Nepal, Bangladesh, Sri Lanka, Bhutan and Maldives, based in Mumbai; Lotus Global Marketing for Brazil, based in Sao Paulo; Lotus Global Marketing-ROLA for South America (Colombia, Caribbean Islands, Ecuador, Peru, Chile, Argentina, Honduras, Belize, Nicaragua, Panama, Costa Rica, Guatemala and El Salvador), based in Bogota; Sagoo for France, based in Paris; Animation International for Turkey, based in Istanbul; and NLC for the Nordic territories (Denmark, Norway, Sweden, Finland and Iceland), based in Copenhagen. "Since joining SYBO, we have carefully planned the strategy and have now assembled the right partners to deliver the Subway Surfers' authentic street-smart, edgy youth culture, skate, music and dance influence - pillars to which our consumers desire," said Amarchi-Cuevas. "Each of our new partners understands this and offers a terrific perspective to further bolster the brand in their respective territory, with a unique proposition." On Friday, Jan. 11, SYBO will release a surprise 11th episode, nearly double the length and leaving fans hungry for more. The episode will launch on SYBOTV, a video streaming, content creation and distribution platform to provide a one-stop digital destination for fans to dive further and share the Subway Surfers experience. SYBOTV also offers game live streams, trailers, extensive behind-the-scenes looks, lifestyle content and a platform for influencers and content creators from across the globe - a central location to share their original Subway Surfers content. Fans can view a teaser here now. The announcement comes after another banner year for the property. Boasting over 2.1 billion downloads in its six-year history, SYBO Games' world-trotting Subway Surfers was the second most downloaded mobile game of 2018, behind newcomer, hyper-casual game Helix Jump. It was the first game to cross one billion downloads and the most downloaded game ever in Google Play's 10-year history, and the most downloaded endless runner game in the App Store's history. Last June, Subway Surfers: The Animated Series premiered, a 10 x 4 minute-series, scripted by Brent Friedman (Star Wars Rebels, Star Wars: The Clone Wars) and produced by Daytime Emmy award-winning producer Sander Schwartz (The Batman, Justice League, Scooby Doo). A long-form series is slated for the near future. SYBO Games is a Danish mobile games developer founded in 2010, known for the massive mobile hit Subway Surfers (co-developed and published by Kiloo). Six years since the launch of the mobile game, Subway Surfers topped 2017's most downloaded mobile game in the world. Subway Surfers has been downloaded more than 2.1 billion times since its launch. To find out more, please visit http://sybogames.com/.